Our team attends NATIONAL and INTERNATIONAL events to maintain a direct line in the media, marketing, and adtech industry, understand the most recent market trends, and continue growing our progress partners network. We are thrilled to announce the official date of our 3rd annual Progress Connect. This year's 2018 summit will take place on Tuesday, October 16th here in our hometown of Boston. To request your invitation, please email Emily Leinbach at marketing@progresspartners.com. Progress Connect’s secret strength is its community — a gathering of the best and brightest from every corner of the media and marketing world. Your participation last year was invaluable, and we hope that you will once again join us to help make this the best gathering yet. 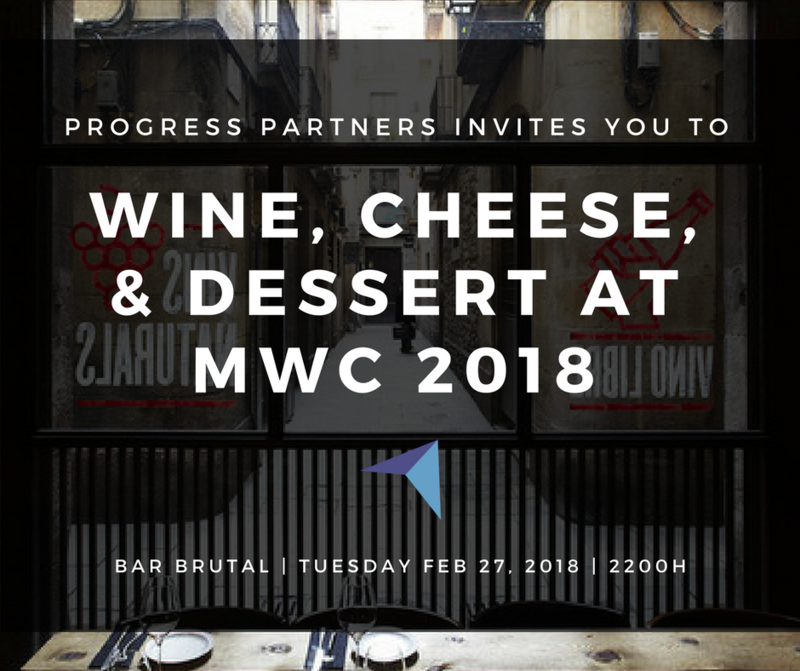 Sam Thompson, Senior Managing Director at Progress Partners, plans to host a small intimate gathering with industry leaders at Mobile World Congress. Wines will pair with cheese and desserts during this after-dinner networking opportunity in Barcelona's downtown district. We look forward to another successful MWC this February 26-28! To learn more about our agenda, speakers, and breakout session content, visit our website using the button below. In conjunction with Progress Ventures portfolio company Pixability, a video ad tech company based in Boston providing targeting, automation, and viewability across the Walled Gardens, we hosted a pre-Dmexco cocktail party in Cologne to celebrate the opening of the event. With over 40 leaders in digital media, marketing, and advertising tech, we enjoyed some German steins and regional hors d'oeuvres before meetings began the following day. It is events like these where we can bring together our local and international networks for a few short hours before back-to-back meetings commence. We look forward to seeing everyone next year for Dmexco 2018! While Chicago can be a difficult city to weather in the winter, it is a lovely place to dine with associates and colleagues, new and old. Our Progress Connect dinners are one of our favorite ways to sit down with colleagues each quarter and discuss various problems and trends surrounding digital media, marketing, advertising, and Internet technology. This month, we gathered together a group of 13 industry leaders (plus one former intern) at Remington's Chicago location. What a great night! We co-hosted a kickoff party Sunday evening with Adform, the global digital media and advertising technology company based in Copenhagen, Denmark, entertaining over 100 guests throughout the night. Executives and industry leaders from advertisers, publishers, top agencies, and leading brands celebrated the start of 2017's Cannes Lions International Festival of Creativity. Thank you to everyone who joined us. Look forward to a snapshot of our time there from one of our partners! With the topics of transparency and brand safety so relevant in our industry, wanted to create a forum to discuss the implications of trends fake news on media and advertising. We brought together a group of 25 industry leaders for a rooftop dinner in the heart of Greenwich Village on a beautiful summer evening to enjoy good food and wine, and to discuss the future of digital media with these challenges in mind. Dozens of past clients, associates, and friends of the firm gathered at Cinquecento in Boston's South End to celebrate 15 years of business for Progress Partners. We celebrated with great food and cocktails, and toasted to the partners with champagne and cake following a few words from each of the partners. Nick, Sam, Chris, and Rick thank all those who attended and look forward to the continued celebration throughout the year. Following the day at Mobile World Congress, dozens of industry leaders from leading technology and digital media companies joined the Progress Partners team for wine and cocktails on their rooftop deck in the centrally located and chic Eixample neighborhood before heading off to their dinners. Thank you to everyone who could attend, and to those who were unable to make it, the team hopes to see you next year! Progress Partners is pleased to announce our inaugural Progress Connect, which took place on October 27, 2016 at The Liberty Hotel in our hometown of Boston. Progress Connect was a day of interactive discussions, distillations of leading practices, and applications of technology, leveraging the deep industry experience and entrepreneurial heritage of our network. The event hosted 275+ attendees and speakers from a select community of industry and investment peers, market visionaries and influential CEOs. True to the Progress Connect name and the history of our firm, this was a great opportunity for the exchange of ideas with industry leaders while building meaningful connections. Progress Partners hosted our first annual Video Data dinner at Claudette, featuring CEOs and senior leaders from a variety of top industry firms. From CEO of Industry Maps and Senior Associate at Progress Partners, Davis Rosborough said "the Progress Video Data Dinner last night was a huge success," going on to say "there was one sustained, engaging group conversation lasting from the hummus appetizer through the closing double espressos." Our founder and Senior Managing Director, Nick MacShane, played emcee for the night and steered the conversation to cover a wide range of topics, key to the evolving role data is playing in the video space. We look forward to having more events like this in the coming months!